The Artificial Neural Networks in Medicine and Biology Society (ANNIMAB-S) is based at Göteborg University (GU) and is open for individual membership to anyone with an active interest in artificial neural networks. 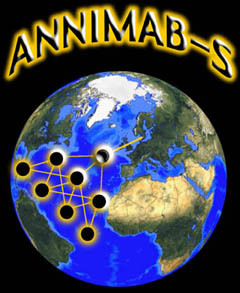 ANNIMAB-S is associated with several other Swedish groups working with biological or medical applications of neural networks. One of its tasks is the coordination of educational and research activities about artificial neural networks; another one was the organisation of the ANNIMAB-1 conference in Göteborg, Saturday May 13, to Tuesday May 16, 2000. The ANNIMAB Society, ANNIMAB-S, is open for membership for everyone with an active interest in the use of artificial neural networks and related techniques in medicine and biology. So far, the Society is mainly a discussion forum, and the main channels for this discussion are our Web pages and the ANNIMAB Mailing List. Membership is free and carries no obligations whatsoever. To become a member, just send us an e-mail with a short description of yourself and your background. See also the GCS visualisation toolbox (from the same author). We encourage other researchers to share their data with the world. The first international conference on Artificial Neural Networks in Medicine and Biology, ANNIMAB-1, took place in Göteborg on May 13-16. The program and abstracts from the conference can be found here. Medical applications of artificial neural networks: for better diagnoses and predictions from clinical and laboratory data, in the analysis of ECG and EEG signals, in medical image analysis, for the handling of medical databases, etc. Uses of ANNs in biology outside clinical medicine: for example, in models of ecology and evolution, for data analysis in molecular biology and in models of animal and human nervous systems and their capabilities. Theoretical aspects: recent developments in learning algorithms, ANNs in relation to expert systems and traditional statistical procedures, possible roles of ANNs in the medical decision process, etc. ANNIMAB-1 featured forty-two presentations of submitted papers organised into six oral sessions and a poster session. There were also nine invited papers presented by highly renowned authorities in the field, covering a broad range of issues in the theory of artificial neural networks and their application to medicine and biology. In order to facilitate the participation of medical and biological scientists with only limited knowledge of ANN techniques, but also to introduce mathematicians and statisticians to the main medical and biological applications of ANNs, the first half-day of the conference offered a set of overview lectures, giving up-to-date information about ongoing research in these fields. The full text of the opening lecture can be found here (pdf). The Proceedings of the ANNIMAB-1 conference are published in the series Perspectives in Neural Computing (Springer-Verlag London) and can be ordered separately. ANNIMAB-1 was the first international conference having artificial neural networks in medicine and biology as its exclusive topic. Participation in the conference hence offered an unique opportunity to be informed of recent developments in this rapidly expanding field. We are collecting links to people and organisations working with medical applications of artificial neural networks and related techniques. We propose a computer based method that performs the quantification by means of automated image analysis and pattern recognition. The goal is to fully automatically identify the bones of the hand/wrist and extract exact quantitative information about the extent of the erosions caused by rheumatoid arthritis based on a radiograph. A case-based reasoner tool has been developed, allowing users to compare the ten-closest matching cases to the newest patient admission, from a database of intensive care medical records. A back-propagation, feed-forward artificial neural network has been trained and tested to estimate patient outcomes: duration of artificial ventilation, the length of stay , and mortality. M. Frize, H.C.E. Trigg, F.G. Solven, M. Stevenson. B.G. Nickerson. The aim of the project is to study non-linear techniques in medical data analysis. The terms soft computing or computational intelligence are used to cover non-linear techniques, such as neural networks, fuzzy logic and neuro-fuzzy tools. Recently, it has been shown that these techniques are very useful in pattern recognition from images or curvilinear signals. In our project, we apply soft computing to clinical problems, in which the model is expected to be non-linear and, accordingly, conventional statistical techniques do not give satisfactory results. In this project we develop a system for classification of cells in fluorescence microscope images with a minimum of interaction by a user. The work started in December 1998 in a close collaboration of the work group Neuroimmunology and Molecular Pattern Recognition at the University of Magdeburg. The aim is to develop and analyse methods to score cells in certain multi-parameter images automatically. Population activities as well as underlying single cell voltages are simulated during normal and epileptiform activities in the hippocampal CA3 slice. It is demonstrated that our model can reproduce electrophysiological phenomena characteristic to both single cell and population activities. Specifically, fully synchronized population bursts, synchronized synaptic potentials, and low amplitude population oscillation were obtained. The project addresses the question: Given a goal and the motivation to reach it, what mechanism allows goal-directed responding? Goal-directed responding has perhaps been most intensively studied in the past by bringing people in situations where they had to resist temptation, thereby exploiting what is expressed by a famous quotation of Oscar Wilde (1893): "I can resist everything except temptation." In the first phase of the project we will try to further knowledge and competence concerning ANN and related analytical methods. Later, these methods will be applied to selected medical problem areas where the amount and kind of available data require unconventional approaches. Examples are extraction of 3-D information from NMR (nuclear magnetic resonance) images, prognostication in neurosurgical intensive care, improved heart infarctation diagnosis with electrocardiography (ECG) and methods to determine the cause of fever in patients who are being treated for blood malignancies. A comparison of numerical risk computational techniques in screening for Down's syndrome. In this paper we will compare three different optimisation techniques in calculating the risk of a foetus having Down's syndrome. Techniques described include statistical methods (multiple Gaussian formula, (MGF)) and are compared to neural network approaches using multi-layer perceptrons (MLP) and preprocessing perceptrons (PPP). InferSpace has over 15-years experience in artificial intelligence, data analysis, and information visualization. Our Mission is to help you or your clients make better decisions from knowledge and data through the use of state-of-the-art methods for analysis, modelling and visualization. A neural network approach was applied for the differential diagnosis of interstitial lung diseases, using both clinical and radiographic information. Neural network learning algorithms with applications to control and signal processing problems. Current research topics include efficient learning in hidden units, reinforcement learning, control of alternative-fuel engines, recognition of EEG patterns, control of HVAC systems, and parallel algorithms for reinforcement learning (contains many papers). We have a wide range of research projects in every aspect of digital chest imaging. These include the use of Bayesian statistical estimation to compensate for scattered radiation in chest radiographs, as well as to improve the appearance of solitary pulmonary nodules for lung cancer diagnosis. Several computer-aided diagnosis projects are underway, including the use of artificial neural network predictive models to predict acute pulmonary embolism based on findings from the chest radiograph and ventilation/perfusion scans. Two-layer and three-layer feed-forward artificial neural networks were trained to predict behvioural performance from single-trial EEG in autistic and normal subjects in a task involving response to rare stimuli and shifting of attention between vision and audition. Eyeblink artefacts were removed from the data using a frequency-domain filter. Performances of the networks on separate test sets varied across subjects but were usually at least 80%.